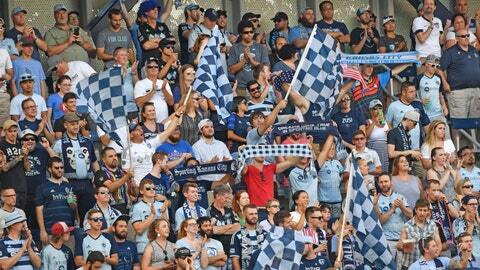 Sporting Kansas City fans celebrate before a 2017 game. FOX Sports Kansas City will televise 26 Sporting Kansas City matches in 2018, serving as the exclusive television home of the club for the second straight season. A detailed television schedule was unveiled Friday. All Sporting KC matches not televised nationally will air on FOX Sports Kansas City or FOX Sports Kansas City Plus in Kansas, Nebraska and western Missouri and on FOX Sports Midwest or FOX Sports Midwest Plus in St. Louis. The vast majority of these matches will also air in the Mid-Missouri and Iowa markets on FOX Sports Midwest or FOX Sports Midwest Plus. ESPN and FS1 will collectively televise eight Sporting KC fixtures to a national audience. Like last year, viewers within Sporting KC’s TV footprint who receive FOX Sports Kansas City or FOX Sports Midwest as part of their television subscription will be able to stream Sporting KC telecasts on FOX Sports GO. To stream games, viewers must sign in with their pay-TV provider user ID and password. FOX Sports GO carries no additional charge and can be accessed with the FOX Sports GO app or at FOXSportsGO.com. FOX Sports Kansas City/Midwest programming is also available on several live streaming TV services such as Sling TV, YouTube TV, Hulu with Live TV and FuboTV. Nate Bukaty will return for his fourth season as Sporting KC’s play-by-play announcer, while Matt Lawrence — who enjoyed a 20-year playing career in his native England — will be color commentator for the second straight year. Also joining the broadcast team is sideline reporter Carter Augustine, who has called Sporting KC matches on the radio and served as the Swope Park Rangers’ play-by-play announcer for the last two seasons. Sporting KC will produce the broadcasts, including 30-minute pregame and postgame shows. Bukaty, Lawrence and Augustine will team up later this month at the Mobile Mini Sun Cup in Tucson, Arizona, providing the live-stream call of Sporting KC’s exhibition matchups against the New England Revolution on Feb. 21 and an opponent to be determined Feb. 24. In addition, Sports Radio 810 WHB will continue as Sporting Kansas City’s radio partner in 2018. All 34 regular-season contests will be broadcast on Sports Radio 810 WHB or one of its sister stations. The TV schedule and FOX Sports Kansas City channel numbers for major local video providers are below. Additional channel numbers can be found at FOXSportsKansasCity.com. For the full Sporting KC 2018 TV schedule, click HERE. For FOX Sports Kansas City channel numbers, click HERE.